Thousands of people, upon release from jail, search the Internet for phrases like, “Is a DUI a felony in Georgia?” or “Is a DUI a misdemeanor or a felony?” Because almost every state’s DWI-DUI laws call for the custodial arrest of any person charged with driving under the influence, many citizens arrested for drunk driving are convinced that their arrest must be a felony. A felony DUI carries serious consequences. The experience of being cuffed, placed in a police transport, and taken to jail is both emasculating and traumatic. It is imperative that you retain the best lawyer if you have been arrested and want to know if your DUI is a felony in Georgia. Below, the most common questions on this topic get answered, by a DUI lawyer in Atlanta who has been a drunk driving book author for over a quarter of a century. When is a DUI a felony? This varies from state to state. Is a DUI a felony? The 6 ways a DUI is a felony. What is felony DUI? Felony DUI charges defined. Is DUI felony? When is a DUI a felony? Can a DUI be a felony? Yes, in all states under certain circumstances. Is your first DUI a felony? Almost never. The legislative branch of government writes laws in each state. Those legislators decide which situations and circumstances will escalate a misdemeanor DUI to make them DUI felonies. So far, no state has passed a first offense DUI as being a felony, absent other aggravating circumstances or factors. Car accident by a drunk driver causing serious bodily injury or death. Depending on the state, such DUI crimes, even for a first offense DUI, can result in felony charges and felony DUI penalties. The different states name the crime in a variety of ways, such as vehicular homicide, serious bodily injury, manslaughter, DUI with grievous bodily injury, etc. some states even call it murder. Repeat offenses, in almost every state, can determine what makes a DUI a felony. Indiana is the only state where a non-accident second offense DUI can be a felony, but many states make a 3rd DUI a felony (e.g., Michigan makes any third DUI in your lifetime a DUI felony). Certain high risk “operators” of vehicles are held to a higher standard of care because they are responsible for the safety and well-being of others, who are dependent upon a supervisory adult driver. For these motorists, ANY DUI can be a felony. By way of example, an intoxicated or impaired school bus driver in Georgia can be charged with a felony DUI, even if it is a first DUI offense in his or her lifetime, since the Legislature has deemed such a drunk driving to be recklessly disregarding the safety of many dependent children. As covered by the previous answer, your state laws (where you are driving) control when a driver is going to be charged with DUI felony. Using the example of a school bus driver being held to a higher standard in GA, if a South Carolina school bus coming to a Georgia venue to play a high school football “challenge” game is pulled over for a traffic ticket and the driver is arrested for DUI in Georgia, this special felony law in Georgia applies. This is despite the fact that the State of South Carolina may not have the same law making a school bus driver subject to DUI felony punishment. Drunk driving penalties by state vary, so you must find an attorney who knows the latest DUI punishment for each state. On a similar note, over a dozen states in the USA criminalize an implied consent law “DUI refusal,” if (after a lawful arrest) the driver does not agree to submit to the state-administered breathalyzer test or DUI blood test requested. If that driver has prior DUI convictions, some states (e.g., North Dakota, Minnesota, and Iowa) may impose felony punishment for the DUI refusal, regardless of whether the driver is later convicted of driving while intoxicated. The lesson here is that a person who chooses to drink and drive in another state is subject to being criminally sanctioned by the criminal laws of that state. Punishments can include Draconian implied consent law provisions calling for years of no driving privileges, or (in about a dozen states) jail time or state prison time for certain repeat DUI-DWI offenders who refuse to submit to the post-arrest DWI-DUI test. Therefore, asking “is a DUI a felony” depends largely upon your prior criminal history and the state in which you are traveling. Is a DUI a Felony Conviction? Taking into account the lessons learned from the first two answers, this question has already been partially answered. Once more, always initially look at state law to determine is a DUI considered a felony. What applies in a California DUI will not be the same as a Georgia DUI, or a Texas DWI, or a DUI offense in Arizona. What constitutes a felony DUI? Homicide by vehicle, of a pedestrian or any other person (whether the fatality of for a person in your vehicle or in another vehicle). Some states have a separate vehicular feticide law, and Georgia is one of those states with a separate feticide law. Some states have felony DUI laws concerning passengers of a certain age in the car. This is known as driving under the influence (DUI) with child in the car— or with multiple children in that vehicle. Fewer than 10 states make EVERY situation with an underage passenger a felony (e.g., Missouri, New York), but most require a 2nd DUI-DWI or more, with such DUI child endangerment enhancement to felony vs misdemeanor. Some states create DUI laws that require a higher standard for the driver simply based upon what TYPE of vehicle he or she is driving. Under DUI laws in Georgia, a school bus driver who is DUI will be facing DUI felony charges, whereas if he or she was transporting the same children in a regular passenger van, any offense will be a misdemeanor, unless multiple underage children (in Georgia, those under age 14) are passengers, since Georgia DUI laws make the third and subsequent child endangerment passengers a felony DUI for EACH one. If you are driving in violation of your current state habitual violator status, this may be a felony. Once more, each state defines WHEN DUI misdemeanor or felony charges will apply. If you are facing a DUI felony, a common characteristic of a felony charge is that you ARE entitled to a jury trial, and you ARE facing more than 12 months in state prison, as a general rule. This is the primary legal distinction between DUI felony vs misdemeanor charges. Other DUI penalties for felony DUI will be outlined by state law in the venue (state where arrested) for DUI. However, due to decades of federal regulations calling for taking away dangerous drivers’ licenses, one consistent DWI-DUI penalty is losing the right to drive for an extensive period of time, for driver’s license suspension or license revocation, depending on the state of licensure. Plus, whether you can obtain a limited driving permit is up to the state of licensure. When Is a DUI a Felony Under Georgia DUI laws? In most states, when a person is facing an accident-related felony DUI, his or her DUI lawyer may try to have the trial judge instruct jurors of a “lesser included offense,” so that the jury has the option to convict of a simple traffic offense (e.g., following too closely) which creates a misdemeanor sentence and not a felony sentence. By way of example, assume that the BAC level of your DUI blood test was low, like a 0.058, the jury could opt to not convict of the DUI vehicular homicide in the first degree, under Georgia laws, and instead convict you of second degree vehicular homicide for a non-serious traffic offense, like following too close. This is one of many DUI defense strategies your DUI attorney may use to protect you from having a DUI felony. Have you taken any medications today? All questions are designed to INCRIMINATE you, and to give the officer “articulable suspicion” of DUI. Once a person talks, the likelihood of the driver in a DUI fatality or serious injury by vehicle accident going to jail increases. This can be for driving under the influence of alcohol or drugs, or a combination of these. Plus, most states make DUI inhalants another type of impaired driving. If the driver refuses to be tested by a breath alcohol test, he or she will likely be subjected to a forcible DUI blood test, pursuant to a search warrant. This judicial warrant process has been part of Georgia DUI laws in any DUI in Georgia, since 2006, and has been sanctioned by the United States Supreme Court in DUI-DWI cases since 1957, in the case of Breithaupt v. Abram. Is Your First DUI a Felony? The foregoing sections have educated you to know the rare, but possible, scenarios for felony DUI indictment. A driver involved in an accident causing serious physical injury to another, or any death, should remain silent and NOT TALK, and only give his or her NAME and ADDRESS. Until an arrest is made, anything the person says is not “protected” under the Constitution. In the quest to uphold DUI death convictions, most state appellate courts have found a way to uphold a felony DUI conviction involving serious injury or death. Remember that Miranda rights in DUI arrests are generally not required until you are arrested and cuffed, when it comes to police questioning at an accident scene. Remaining silent is the best universal advice from a DUI defense lawyer. If police collect your blood using a warrant, this search warrant may NOT be legal, if it wasn’t based on probable cause to suspect driving while intoxicated. Is getting a DUI a felony? Not in most first offense DUI cases, as is covered above. Absent a car accident with injuries or death of another person (in your vehicle, another vehicle or as a pedestrian), or multiple child endangerment charges the answer to “is your first DUI a felony?” is NO for drunk driving first offenders. Drunk driving book author William C. “Bubba” Head, DUI lawyer in Atlanta, is a 42-year veteran Atlanta criminal defense lawyer and Board-Certified drunk driving attorney. He and his criminal justice attorney partners operate a DUI law firm in Atlanta, Georgia. Bubba Head, or one of his other DUI lawyers, can assist you — anywhere in Georgia — on a repeat DUI offense or serious bodily injury or DUI fatality case. 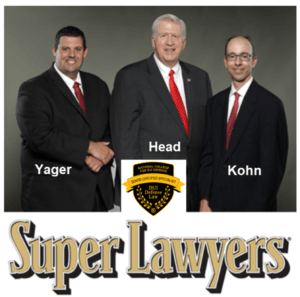 DUI attorney Larry Kohn, DUI lawyer Cory Yager, or DUI attorney William “Bubba” Head can help you with a driving while intoxicated case. Mr. Kohn and Mr. Yager were each invited to write chapters for two different national drunk driving books published for lawyer. These books focus on how to get out of a DUI, by using aggressive litigation techniques. Their publications were released in 2016. 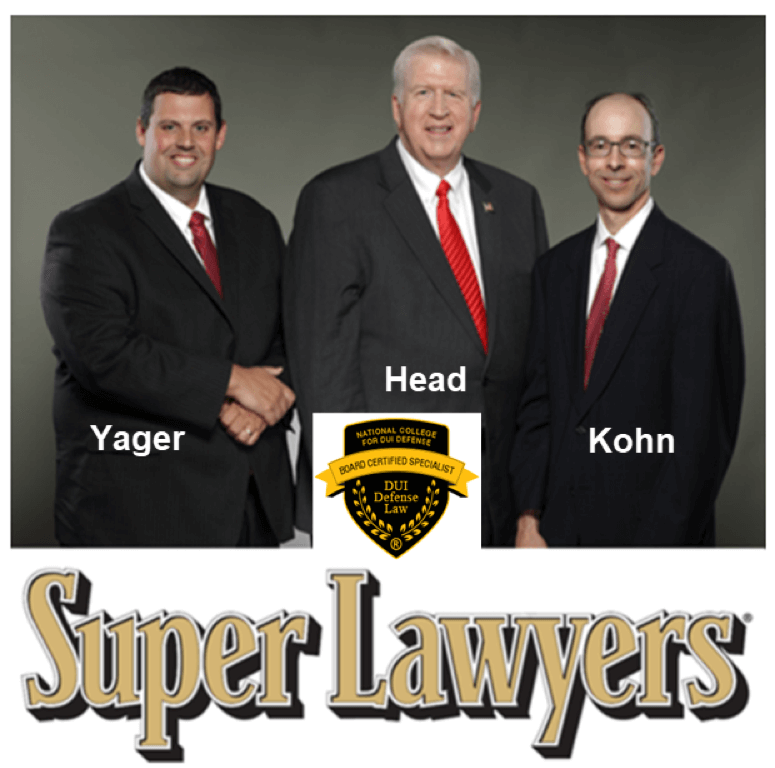 When you hire any of the DUI law firm partners, you have one of three Super Lawyers for 2017. To learn more about DUI penalties in general, misdemeanor vs felony, click on the previous link. Some people foolishly try to self-assess their chances of winning the DUI in Georgia. The operable word here is “FOOLISHLY.” Just reading TRUE DUI case histories with: (1) BAC levels triple the alcohol legal limit, or (2) with a DUI refusal and failing all three NHTSA field sobriety tests, or (3) another drunk driving case report of a DUI checkpoint with a Intoxilyzer breath test double the legal alcohol limit, from two of our previous criminal trials will dissuade you from thinking that you have no chance to beat a DUI in court. Limit your search to a lawyer for DUI who has achieved legitimate legal industry excellence and stellar attorney ratings. Rest assured that our law firm has the RIGHT criminal defense attorney for you, if you plan to FIGHT the case. We charge “flat fees” depending on how far the DUI case progresses. Ask our law office about our attorney fees payment plans.